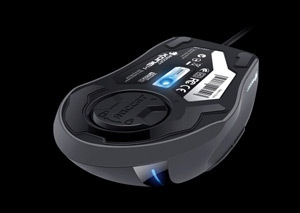 The revolutionary 6000dpi Pro-Aim Laser Sensor, in conjunction with its 10.5-Megapixel resolution and 1000Hz polling rate, offers maximum precision, even transmitting lightning fast mouse movements with up to 30Gs of acceleration and with speeds of up to 200ips (5.08m/s) without loss or lag. 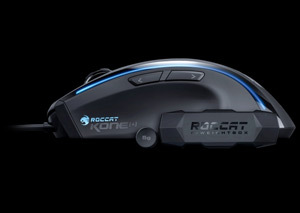 Thanks to the Tracking & Distance Control Unit, which is now integrated in the laser sensor, the ROCCAT Kone+ can also calculate the lift-off distance as well as fine-tune the sensor to suit the mousepad. The result: optimal tracking. The highly praised hybrid shell for right-handers, including the Soft-Touch Surface, have been retained, but really useful core improvements have been made that further increase the comfort of Kone's successor. The mouse wheel is completely new: distinctive notch positions are perfect for gaming, and the wider design makes it easier to control. The button above the mouse wheel has been made larger and you'll now find a nicely-sized toggle switch below the mouse wheel. The result: maximum gaming comfort. Thanks to the Easy-Shift+ button, all the buttons – including the mouse wheel – can be assigned two functions such as macros or other functions. As a result, you now have 22 functions available at any one time instead of the usual 12. Like before, the light system remains unbeaten. Four multicolor LEDs, together with the enhanced light-pipes and configurable effects, can light up, alternate or pulsate in more than four different colors at the same time. It's a real eye-catcher on any desktop. You can configure your button assignments, including macros, DPI settings, the sensor sensitivity level and your lighting settings too, and save them to any one of 5 profiles on the 576kB of onboard memory. 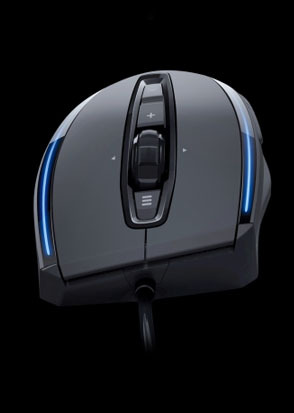 This allows you to customize your mouse to suit individual games. You can associate each profile with a particular application so the right button assignments, DPI and color settings, etc., are automatically loaded when you start the game. When a profile is set as the Windows Profile, the ROCCAT Kone+ will always switch to this profile when you return to Windows after leaving a game or app. Additional profiles can be saved on your hard drive whenever you want, and then loaded to any one of the 5 profile slots using the driver menu. Creating and editing your own command sequences is made easy thanks to the highly praised Macro Manager. Predefined macro presets for the top 20 PC games as well as several office apps make it even easier to customize the mouse – plus the new Loop Function now makes it possible to loop macros up to 255 times. The famous ROCCAT voice gives immediate feedback when you change DPI settings, profiles, the volume level or sensitivity setting. As you don't need to look at an additional display on the screen or on the mouse itself, nothing will distract from the gameplay. It really is as easy at that. A weight system comprising 4 x 0.2oz (5g) weights is included, allowing you to customize the weight in four stages to suit your preferences. 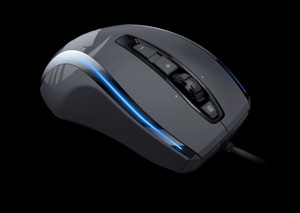 Distinctive notch positions on the mouse wheel and a generous button design are perfect for gaming. The button above the mouse wheel is comfortably large and you'll find a nicely-sized toggle switch below the mouse wheel. Change the play of colors on your mouse to whatever you like. The four integrated Multicolor-LEDs can light up in a variety of different colors and effects. 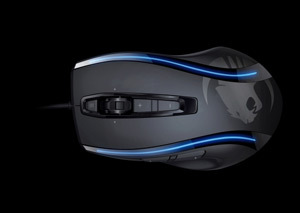 You are able to adjust the weight of the ROCCAT Kone+ to your own preferences. Choose one to four weights of 5g and simply insert them into the base of the mouse.